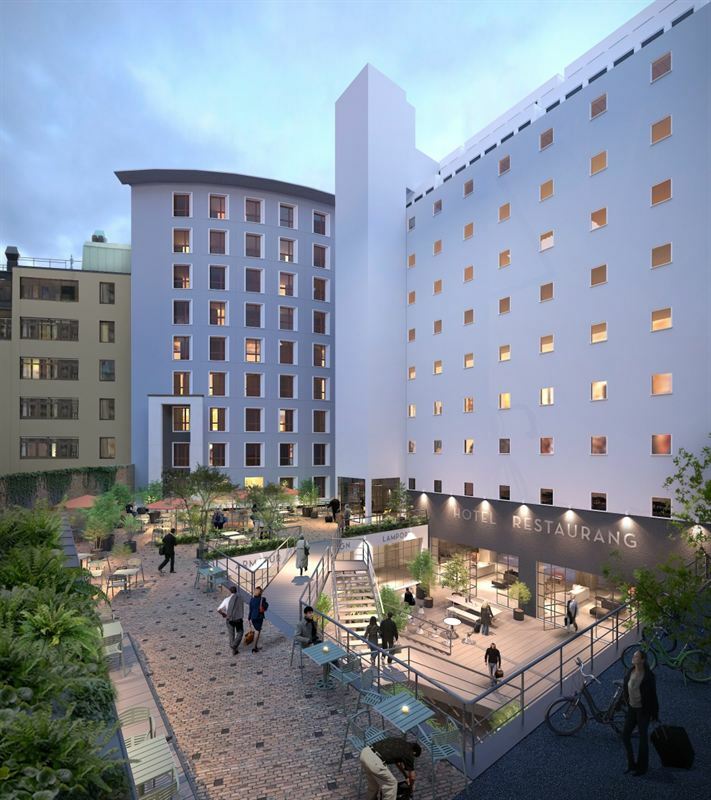 Kungsleden and Nobis has signed an agreement for additional space for the design hotel that Nobis will open in the property Blästern 14 at Gävlegatan in Stockholm. The agreement includes an extension with two floors and a roof terrace in one of the courtyard buildings as well as additional space in the building facing the street, totaling 1,600 sqm. In February, Kungsleden and Nobis signed a 20 year lease agreement for a new design hotel at Gävlegatan in Vasastan, close to the new district Hagastaden. The hotel has, in addition to hotel rooms, also conference facilities, spa, gym bar and a restaurant, and will be a new destination – an oasis in the city – for hotel guests, neighbors, residents and tourists. Following the new agreement, the number of hotel rooms will increase from 242 to 264. The new agreement also runs for 20 years and the extension with two floors and a roof terrace will create spaces for additional hotel rooms and a bar, in total 860 sqm. In the building facing the street spaces of 764 sqm will be converted into spa, gym and conference facilities. ”We are delighted to be able to offer Nobis these new spaces that enhances the attractiveness in the hotel concept and brings us closer to the vision of Blästern as an oasis in the city”, says Biljana Pehrsson, vd Kungsleden. “The new spaces allow us to create additional hotel rooms and offer locals and tourists a bar with roof terrace and stunning views over the rooftops. With the extra space for spa and conference our offer becomes even more attractive, which I'm very happy with. This is a concept which I have wanted to develop for a very long time and I look forward to realizing it together with Kungsleden”, Alessandro Catenacci, CEO of Nobis AB, commented. Kungsleden AB (publ) has owned the property Blästern 14 at Gävlegatan in Stockholm, next to Torsplan and the new district Hagastaden, since 2014. The property has a unique history going back to the 1930’s when architect Sigurd Lewerentz designed an office building and a warehouse for Philips Sweden. The premises history has had a significant influence on Kungsleden’s and Nobis’ conceptual design. The ambition is to create a new destination and meeting place with great vibes and service in the spacious restaurant, bar and lounge areas, moving seamlessly between the indoor environment and the welcoming courtyard. Kungsleden invests MSEK 423 in the project that in total comprises 16 800 sqm. The first phase, that includes the hotel and the new spaces, comprises 11 100 sqm and is expected to be finalized in the autumn 2018. The second phase includes 5 700 sqm office space and other spaces in the building facing the street and is expected to be finalized during 2021. The information was provided for public release on July 4, 2016 at 7:00 a.m.
Kungsleden’s business concept is to own, actively manage, improve and develop commercial properties in growth regions in Sweden and to deliver attractive total returns. Kungsleden’s strategies to create value are based on meeting the premises requirements of customers by managing, improving and developing properties and planning consents and by optimising the company’s property portfolio. Kungsleden has been quoted on NASDAQ Stockholm since 1999.